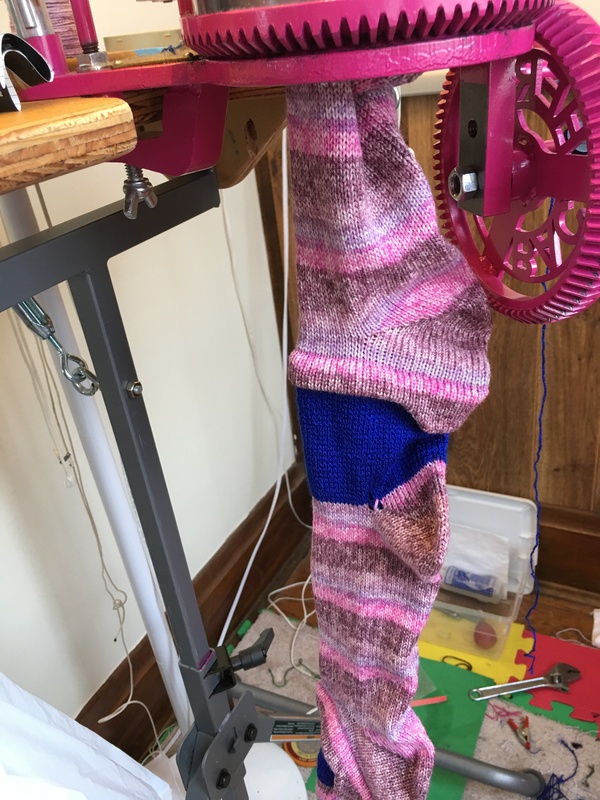 There has been lots of discussion lately on the CSM forums about the learning curve in using a circular sock machine and the difference between user error as opposed to machine problems. 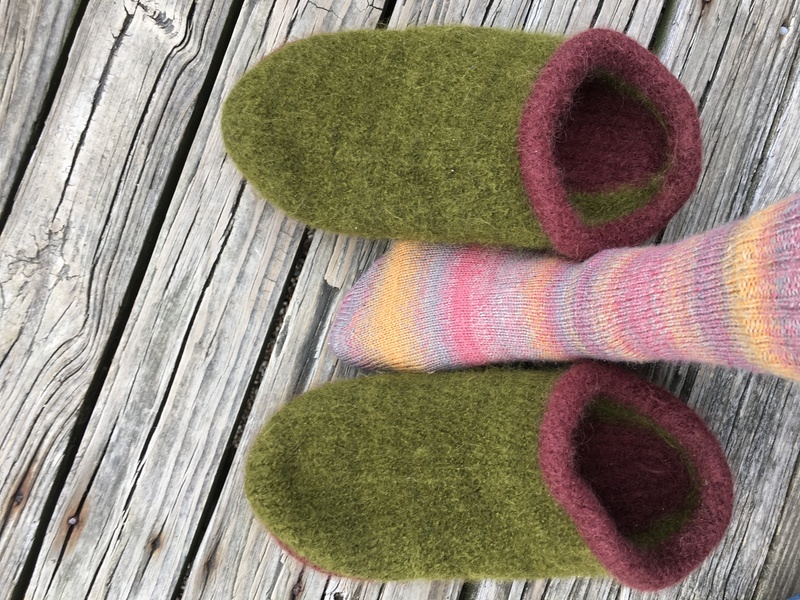 One way to minimize user error is to have a checklist of things to do when you are getting ready to stand or sit at the machine and make a pair of socks. It can help you eliminate some of those little things that go wrong. I put together a list of things that I have been trying to do to keep my head in the game and minimize the problems I cause myself. There are lots of things to check and watch for, and if you miss one of them, you may have to start the sock over. 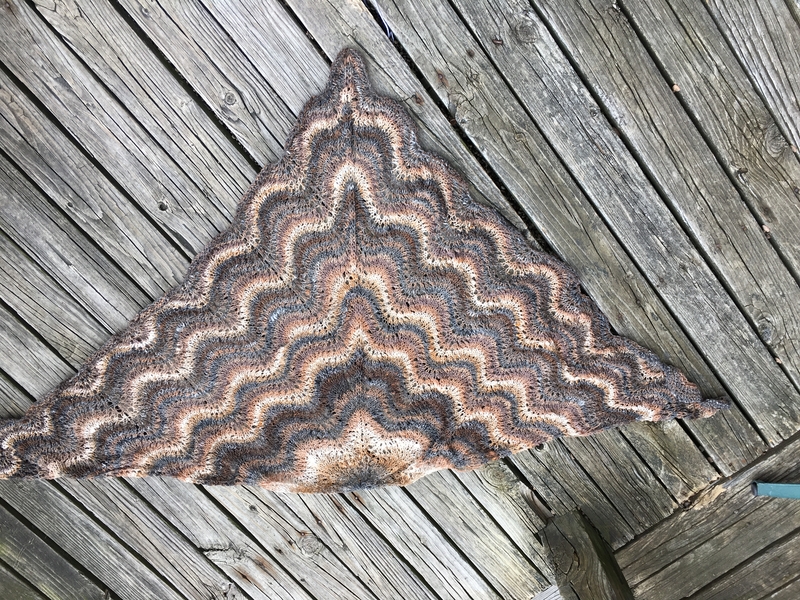 My local weavers guild has started a member challenge called UnFinished Objects Finally Finished. (UFOFF). 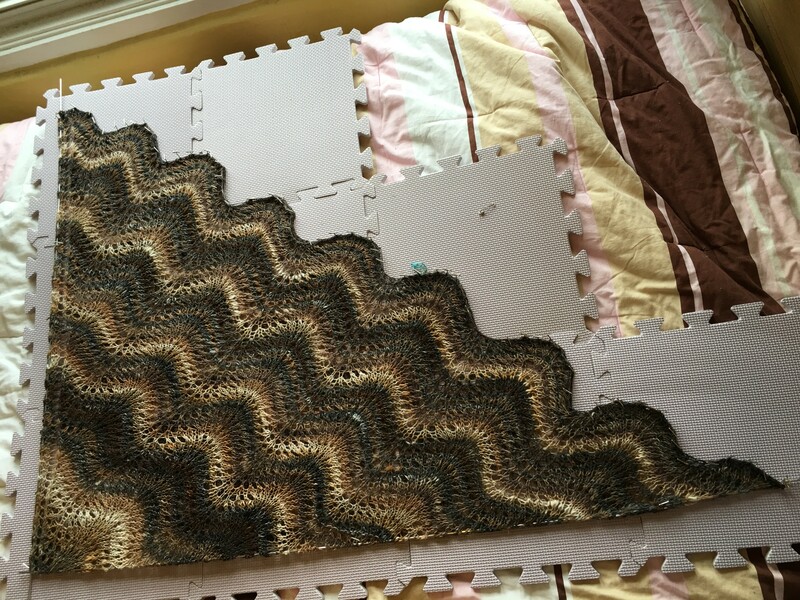 Last week I dug a shawl in its bag out of a box on my yarn storage shelves. No pattern or notes were with it. Today I located the book and made a copy of the chart and translation page for the instructions. A few years back I was in a lace shawl knitting phase. 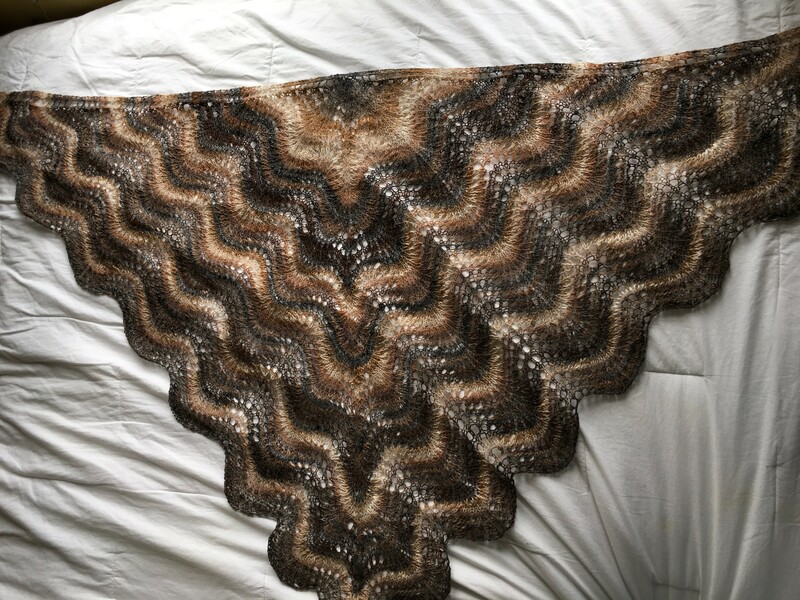 I had finished a lovely shawl from a book called Þríhyrnur og langsjöl / or Three-cornered and long shawls by Sigridur Halldorsdottir. The book was in written in Icelandic but came with a translation of some of the text in the book. The patterns are all charted. 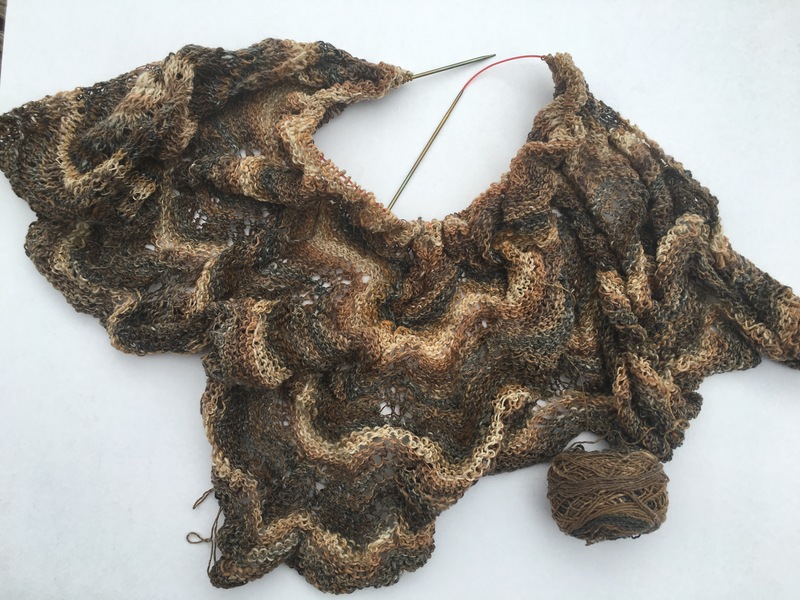 The first shawl I knit from the book was called Hyrna Herbogar and it was fun, but tricky. For my second one, I chose a simpler pattern based on Old Shale lace called Hyrna Með Krónuprjóni (or HMK as it will be referred to from now on). Here is the photo from the book. Mine will look different since I chose a striping sock yarn called Noro Kuryeon in natural colors. 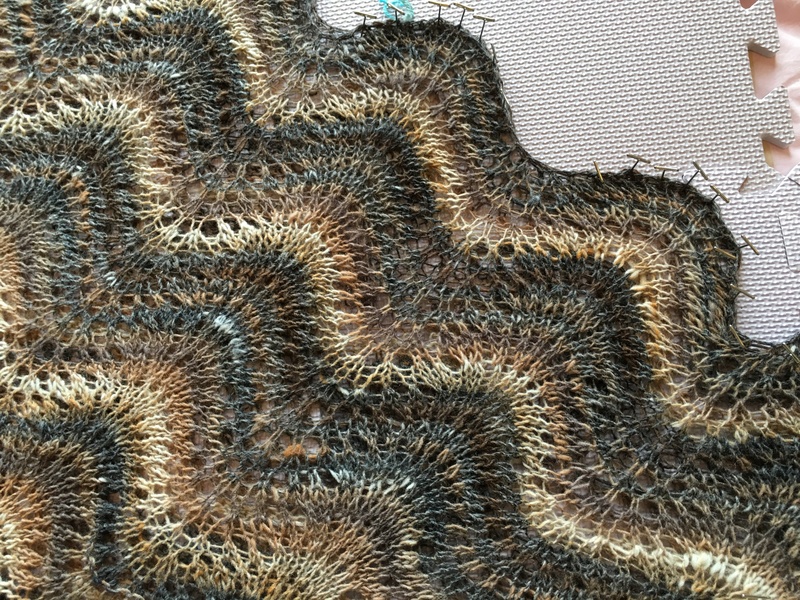 Based on my project notes in Ravelry, I began working on HMK March 16, 2009 and sometime in May, 2009, put it down. From the posts in the Three Cornered Knitters group on Ravelry it appears that I had figured out I was going to run out of yarn for the second time. The post says I had 34% remaining to knit and only 32% of my total yarn remaining (checked by weighing it in grams on a digital scale before and during the knitting). Then there was also a post that said I traded some handmade soap for the some Kuryeon Sock color 149 that another Ravelry member had leftover when she finished her socks. The yarn came pretty quickly after the trade was negotiated, but I never picked HMK back up to start knitting again. How did I know how far I was you ask? I am a geeky knitter and I like to make spreadsheets for shawl patterns to keep track of my yarn usage and percentage completed. So to document how far the shawl was when I picked it back up to finish, here she is two weeks shy of 7 years after beginning. These Cleveland Browns Socks were a bit painful for me to knit as a die hard Cincinnati Bengals fan. But, my love for my son (also a die hard Bengals fan) outweighed my distaste for the Browns. His girlfriend is from the Cleveland area and is a Browns fan, and I wanted a Christmas gift to give to her. Fortunately, the Browns have had a dismal record this year and the Bengals beat them both times we played them or I might not have been able to overcome the loathing enough to do it. (Mom did say she put a curse on the socks to keep them from beating the Bengals in the future). They lost to Pittsburgh once this year, but maybe the socks will bring them the luck the need to beat the Squealers Steelers in their January 3 game. I actually hate Pittsburgh more, so sorry Juliann (my sister-in-law) there are no Steelers themed socks in your future.